Oil rubbed solid bronze curly tail casement window fastener. Supplied with a mortice plate fastener or hook plate fastener. 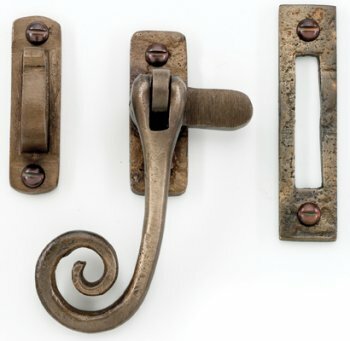 Cast from solid bronze, all items pass through a series of hand applied chemical processes to help achieve this natural patina with the finish completed with a thin coating of beeswax.